Infrared and Raman Spectroscopy, Principles and Spectral Interpretation, Second Edition provides a solid introduction to vibrational spectroscopy with an emphasis on developing critical interpretation skills. 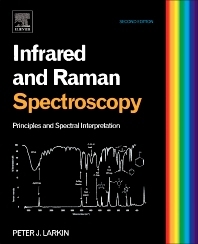 This book fully integrates the use of both IR and Raman spectroscopy as spectral interpretation tools, enabling the user to utilize the strength of both techniques while also recognizing their weaknesses. This second edition more than doubles the amount of interpreted IR and Raman spectra standards and spectral unknowns. The chapter on characteristic group frequencies is expanded to include increased discussions of sulphur and phosphorus organics, aromatic and heteroaromatics as well as inorganic compounds. New topics include a discussion of crystal lattice vibrations (low frequency/THz), confocal Raman microscopy, spatial resolution in IR and Raman microscopy, as well as criteria for selecting Raman excitation wavelengths. These additions accommodate the growing use of vibrational spectroscopy for process analytical monitoring, nanomaterial investigations, and structural and identity determinations to an increasing user base in both industry and academia. Peter J. Larkin leads Solvay's Spectroscopy and Materials Characterization group based in Stamford, Connecticut. He has more than 25 years of experience using IR, Raman, and NIR spectroscopy in the chemical and pharmaceutical industry. This includes managing research groups in R&D environments as well as directing analytical method development, validation, and transfer teams. He specializes in IR and Raman spectral interpretation, spectroscopic chemometric analyses, early phase API and chemical development support, and process analytical techniques (PAT). Dr. Larkin received his PhD from the University of Pittsburgh in 1990 using resonance Raman and vibrational circular dichroism spectroscopy to study heme proteins. Since that time he has worked in analytical departments both in the specialty chemical and pharmaceutical industries. While at American Cyanamid/Cytec Industries in Stamford, CT, Larkin received comprehensive training in IR interpretation from Dr. Norman B. Colthup. He subsequently worked at Wyeth Pharmaceutical, had a brief stint with Pfizer, lead the solid state analysis group at Bristol-Myers Squibb, and now leads the spectroscopy and materials characterization group at Solvay. Well rounded book for learning the basics as well as the more advanced background of IR. Also the book is filled with illustrated and explained examples so useful for learning spectral interpretation.